Voice of a Guest...David Former soup kitchen guest David was making the rounds on his delivery route one morning when he stopped at a familiar church. Realizing it was Holy Apostles Soup Kitchen, where he found his footing when he was unemployed and homeless, he knew he had to stop in to express his gratitude. “I went and found the counselor who had helped me years ago,” he says. Walking into the soup kitchen after five years had passed, David was transported back in time to his first visit. “I came here and they offered me friendship,” he recalls. Originally from Miami, David had lost everything—his job, his home, and his marriage —after the 2008 economic crash, and decided to move to New York for a fresh start. “I thought there would be more opportunity…” he explains. But with no savings, he was unable to afford a place to live or find a job. For the first time in his life David was homeless, sleeping at night in the New York City shelter system. I felt safe here. I felt embraced. There were always listening ears if I had a problem. May 17th, 2018 We hope you can join in on our 6th annual food and wine benefit, Farm to Tray, on May 17, 2018. A celebration of food and community, this event challenges New York’s finest chefs to produce a “Sustainable Menu” that is rooted in the soup kitchen’s approach to using fresh, locally grown produce, minimizing food waste, and planning nutritionally balanced and delicious meals. This year, we will be honoring Google for its contributions since moving to their new Chelsea location. In addition to its Food@Google contribution to the culinary line-up, the company has donated the largest single Farm to Tray corporate gift in the event’s history. “Google has shown a level of commitment that dramatically raises the bar, and leads by example,” says Interim Executive Director Bishop Andrew R. St. John. “Their generosity is an inspiration for all of us to step up for the most vulnerable in our city.” To kick off the 6 pm VIP hour, Gotham Burger Social Club will present Chef Dominick Pepe of The Group NYC. Chef Pepe’s newest restaurant is the highly acclaimed Boucherie Park. At 7 pm, chefs from some of New York’s most distinguished restaurants will present their sustainable tasting menu. Chef Caroline Schiff’s strawberry shortcake was a big crowd pleaser last year. 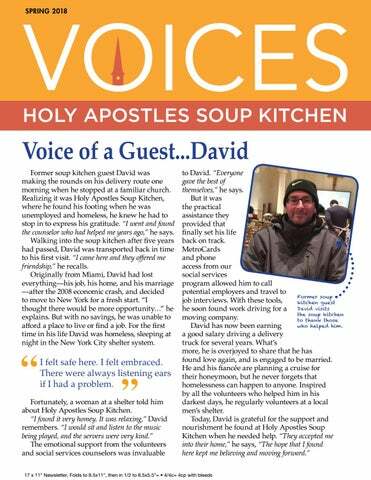 With cuts to food assistance programs and almost 1.2 million New Yorkers experiencing food insecurity, Holy Apostles Soup Kitchen is feeling the impact. “Eating here offers the opportunity to not have to choose between a warm meal or paying rent,” says Michael Ottley, Director of Operations. “And it’s more than a meal. We take our commitment to serving quality, local and non-processed fresh produce seriously… and to offer our guests the kind of support that enables them to help themselves. Farm to Tray truly helps us continue this level of service.” Farm to Tray guests can enjoy this spring-time evening benefit in our delightful garden, and inside our landmark sanctuary where we serve about 5,000 soup kitchen patrons every week. The talented student jazz band from Avenues: The World School and the in-kind support from food, beverage and event sponsors will once again enhance the festive and elegant atmosphere. And with generous donations of luxury items, restaurant and travel experiences, the silent auction is shaping up to keep things lively and fun. It’s not too late to learn more about ways to participate and support our most impactful community fundraiser of the year by logging on to www.farmtotray.org. You can also join the fun by sharing our #farmtotray social media updates with your family and friends! It’s not too late to learn more about ways to participate and support our most impactful community fundraiser of the year by logging on to www.farmtotray.org. Project to conduct a food waste audit on three separate days in February and March. E	use specialized signs and bins provided by DSNY to promote community involvement. are soiled with food waste and no longer recyclable by sorting into the Organics Bins for DSNY to pick up. The compost then turns to soil that benefits farmers and a healthy food system. E	replaced non-recyclable waxed paper cups Check out our new reusable cups—a big step toward zero waste! by purchasing reusable cups that hold both cold and hot beverages. An environmentally responsible solution, this will save us over $14,000 in annual purchasing costs. know? e h t in e Like to b C stlesNY o p A ly o @H ok.com/ n o b e c a f . e www oupkitch s s le t s o holyap m.com/ a r g a t s www.in pkitchen u o s s le t y/ holyapos compan / m o c . kedin www.lin les-soup-kitchen st s/ holy-apo the-holy-apostle fchurch-o chen.org it k p u o s s lyapostle o h . w w w kitchen p u o s y for dail updates!